Fish Calulu, or Calulu de Peixe, is a traditional recipe made in Angolan and São Tomé e Príncipe for a signature fish stew which combines delicious vegetables cooked in red palm oil with okra and sweet potato leaves. 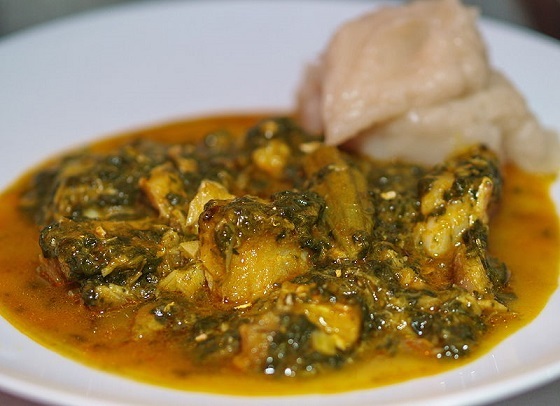 Typically served with funje, a mashed potato like substance made from cassava flour. It is unbelievably rich in different flavors and spices, and is one of the most popular dishes in Angolan cuisine for good reason. 1) Wash the dried and smoked fish thoroughly. Place it in a bowl and cover with boiling water and set aside for 20 minutes. 2) After this time drain the water and add boiling water again, then set aside for 1 hour. After this deskin and debone the fish. 3) In a large saucepan, alternate layers of the dried and smoked fish, onion, tomatoes, garlic, sliced courgettes, sweet potato leaves and sliced okra. 4) Pour the palm oil, scotch bonnet chili, and salt to to taste over the contents of the saucepan. Bring to a simmer then cook for about 40 minutes, or until the contents of the pot are tender.